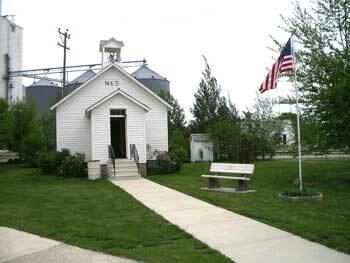 The Vernon Township Country Schoolhouse was built in 1887 in Vernon Township, Wright County, Iowa. The Dows Historical Society and the Dows Community moved the building five miles from its original site and placed it on a permanent foundation near the Dows Welcome Center and Mercantile. 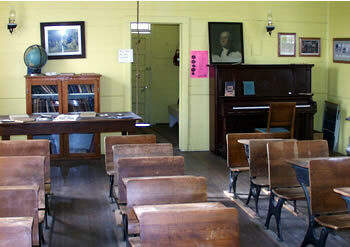 It was restored inside and out and is furnished with original desks, blackboards, and books. The grounds are planted with native trees and shrubs. Vernon Township was formed in July 1856. It was one of the original precincts of Wright County. Originally, it included part of what is now Wall Lake Township and also part of Blaine, including part of Otisville. In 1868, Wall Lake was cut off into a separate precinct. In 1883, the Blaine portion was cut off when the townships of the county were made to conform to Congressional Township Lines. Vernon is the extreme southeastern township of Wright County. It comprises Congressional Township 90, range 22 west. It contains 36 sections. The lowa River touches the eastern edge. Early settlers chose land along the river because of the need of a water supply and because of the excellent timber, which was used for building log cabins and for fuel. About 1862-1863, after land along the river was taken, other portions of the township were settled. Most settlers arrived after the Civil War. Much of the soil in the township was very good farm land. The southwest portion was swampy and once considered worthless. It was called the "wet wilderness of Wright County.” About 1875, a number of German pioneers purchased this wet land and low prices. They tiled the land and found they had very rich fertile ground. Vernon also had 50 acres of peat, once considered valuable as fuel. Occasionally peat bogs would burn for weeks. These caught fire when stubble fields were burned off. The first settler of Vernon Township was E. P. Purcell in 1856 near Wall Lake (not a part of Vernon after 1868). When the first board of supervisors of Wright County was selected in 1861, Mr. Purcell was chosen to represent Vernon. In 1871, he sold his farm to Ben Birdsall of Alden. R. E. Train was supervisor in 1866, D. N. Inman in 1868 and D. H. Pepper in 1883. Mr. Pepper came to Vernon about 1867. Other early settlers of Vernon were C. P. Sheldon, at the close of the Civil War (his son F. B. was born in 1866 in Vernon). A. M. Peterson 1869, Wm. and J. H. Smith 1869, J. M. Rice 1869, John Rich 1869, Paul and Ole Anderson, A. C. Fuller 1871, Luther Hammond early 70's, A. B. Wallace, Fred Gade, Charles Gragert 1870, Herman Beisner 1872, Christian Engelking 1877, Edward Evans 1877, James Flett 1878, William Collins 1878, Fred Schroeder 1879, Herman Schroeder 1879, Henry Schroeder 1879, and John Schroeder 1870's. Milnes (1880) and Collins (1878) were among the last to come by covered wagon. In 1864, there were only twenty schools in Wright County. Records show that in 1860 the school apportionment for Vernon was $200.08. By 1869 there were two school houses in Vernon, showing there must have been two dozen families with school age children. Older boys attended only during the winter when there was no field work to be done. Often they attended when 18 or 19 years old. There is early mention of the Moore School and the Sheldon School. By 1895-1900 most land was taken up so this called for moving schools to geographical centers. There were nine independent school districts. Schools were two miles apart. Education to the 8th grade became compulsory. A township picnic was a feature of the closing day of school each spring. There was a program of recitations, songs, a spell down, awards, presentations of 8th grade diplomas, sometimes a speech by a politician, the picnic dinner followed by races and a baseball game. By 1920's there were 8 months of school classes, later being changed to a 9 month school year. Very few country youngsters attended high school until the 1920's. By the 1940's many districts sent their students to the town school. They paid tuition, $6-$12 then slightly higher later. School reorganization in 1965 closed all country schools in Vernon. Only Vernon No. 5 still stands. It is used only as a township voting place. Before 1884, Sunday school was conducted at the Pleasant Valley School (No. 6) by Mrs. Zimmerman. Visiting preachers conducted church services. Dry Lake Post Office was established in June, 1871. The first postmaster was D. N. Inman. The office was discontinued on July 12, 1882. Before the R.F.D. residents of Vernon obtained their mail from the post office in Williams, Dry Lake, Empire or Otisville. Now in 1980 the population was 822. In 1824, there were 46 voters. After the pioneers arrived, homes were built, groves were planted, land was tiled and fences were put up -- all hard work done by hand. About 1873, fencing came into general use. Cattle had been herded on the open prairie. In 1874, the county voted 272 - 202 for the proposition of restraining stock from running at large. Sometimes there were prairie fires to fight. The sloughs grew tall with wild grass. Even a man could get lost in this grass unless he could see over it by riding in a wagon or on a horse. In late summer and fall, this tall grass was easily ignited. It is told that one farm (where Dan Denger now lives) burned off three different times. The first roads laid out were along the river. One of the first roads worked was known as the Belmond road or stage coach road. It followed the Iowa River from Belmond to Dows and south through east Vernon to Alden and Iowa Falls. Up to this time, there were very few bridged streams. Many of the men spent one day working on the road rather than pay the $2 poll tax. A fine buggy and driving horses were a favorite means of transportation in early days. The first cars appeared early in the century. Roads then were graded and graveled. One of the very best roads was old Highway 15 which went through the western section of Vernon. The route of the road was changed and renamed Highway 69. Other improvements were rural free mail delivery in 1902 and the telephone also in 1902. F. H. Peterson organized the Rural Home Telephone Company. It was connected with the Jamison Telephone Company in Dows. A few who helped with setting poles and other work were named in an old account book - Fred Smith, J. Weedman, Clem Reike, Otto Anderson and Henry Taylor. The wages were $ .15 - .20 cents an hour. The nearest railroad stop was at Alden. In 1897 the cost of a fare on the train from Alden to Clarion was 80 cents. Corn was bringing 25 cents a bushel, oats 50 cents a sack. Potatoes were 30 cents a bushel, butter 16 cents per pound, eggs 15 cents a dozen. Soft coal was $3 or $4 per ton. In 1893, one farmer's account showed he bought a shot gun for $19, a wagon for $53 and a seeder for $13. The next year he bought a windmill for $40 and a hay rake for $20. A new suit cost him $11.50 in 1895. By 1899, settlers were selling wood for fuel at $1 a load or $3.50 for a cord of hard wood. Fred Peterson supplied wood to the nine schools of Vernon Township for $1.50 a cord. The township assessor traveled from farm to farm. Those listed were William Wobbeking 1918 to 1925, John Sutton 1926 - 1927, Zeddie Rout 1928 - 1935, Fred Beisner 1936-1945 and Ronald Beisner 1946-1947. Township assessors were then discontinued in favor of a single county assessor. These pioneers of Vernon had some social life. There were lyceums, debates, spelling bees, ciphering matches, and singing schools. There were barn dances. They danced to the music of a fiddle or drum. There were horse races. Weddings were a special celebration. Fred Peterson organized a concert band while living in Vernon Township in 1879. It was called the "Morgan Concert Band." He traveled to Morgan Township to give lessons and direct the band. There were husking bees and cabin raisings. Popular with the women were quilting bees. The ladies formed afternoon clubs. One such club started in 1915 as a "Larkin Club" in Blaine and northern sections of Vernon. The Larkin Company sold items to the families for which points were earned to later be traded for dishes, furniture, etc. The dishes, many will remember as "bluebird" dishes. In the 1920's this club became known as the Blaine and Vernon Social Club. They now play cards instead of mending or piecing quilts. Once a year, they had a dance, an annual oyster supper and a picnic each July. They still have the oyster supper. Early members of this club from Vernon were Mrs. Earl Cundall, Mrs. Wm. Wobbeking, Mrs. Schroeder, Mrs. J. B. McCoy, Mrs. S. L. LaRue and Mrs. Roosa. Twenty-four ladies met in Vernon township in February 1926 at the George Trowbridge home to organize a club which was named the Vernon Friendly Club. Although a social club, it was planned to work along well defined lines for the improvement of Vernon. The first officers chosen were president - Mrs. W. G. Knox, vice president - Mrs. Charles Barnes, Secretary-Treasurer - Mrs. J. P. Trowbridge. Over the years, the club has had approximately one hundred thirty different members, reaching well beyond the area of Vernon Township. As new members joined the club, others left and the club has maintained a membership of up to thirty active members and has included a great variety of ages - young and old and in between. Lizetta Martin was the last charter members to belong to the club. After forty-four years of active participation, she became an honorary member until her death in October, 1979. Vernon had a 4-H club for girls for many years. An early leader was Mrs. Julius Specht. There was also a 4-H club for boys. Bill Whisler was leader in the early 1930's. There were hard times and hard working these pioneer farmers. Farming was done by horses. The average size of a farm was 80-160 acres. Many chores were done by the light of a kerosene lantern before going to the field at day break and after coming from fields at sunset. Homes were heated and meals cooked on stoves fueled by wood and corn cobs. Coal was purchased for winter heating. Water was pumped by hand and heated in boilers for washing clothes. Big family gardens were raised - much being stored for winter. Hogs were butchered and lard rendered. Meat was browned, placed in large earthen jars and generously covered with lard to preserve it. Large families were common. Nearly every family employed a hired man. He was part of the family. His wages were $15 - $20 per month. His meals were furnished. The farmer's wife did his mending and washing of clothes. If he owned a horse, the cost of the oats and hay to feed it were deducted from his pay unless the horse was used for farming. In winter, if there wasn't work to do, he stayed on and helped with chores for his room and board. Mechanization came in the late 1930’s and 1940's. The first tractors were used for the heavy work such as plowing and breaking sod. Large steam powered engines which burned coal were used for threshing oats. One man was in charge of the steam engine, one the separator and another for water wagon. Others hauled the bundles and unloaded them at the machine. One man stacked the straw. The women cooked the meals for 20-24 men at threshing time. It seemed as if each tried to out do the other with good food. It was served at a big table with white tablecloth. A pail of warm water, basin and soap were outside on a bench with a towel hung nearby for the workers to use for cleaning up. Ii was a feat to get to sit at the “first table". During World War I, men were called to duty. Food was rationed. Wheat flour was hard to get. Word of the end of the war was slow reaching rural sections - no radio or TV. Most cheered when reading it in their newspapers. There were hardships during the depression beginning in 1929. Many farmers lost their farms and had to start over. President Roosevelt introduced a farm program to assist them Corn could be sealed, giving them money for their needs and then later delivering the grain when called for. A big improvement in yield were the hybrid seeds.